Winter Blahs? Plan a Mardi Gras Vacation! Feel like getting in over your head? Plan a snorkeling vacation for the family to the Caribbean, and make it affordable by renting a timeshare. Here’s a list of 5 Caribbean snorkeling spots perfect for budget travelers. More rocky than sandy, Malmok Beach is not for sun worshipers, but it's perfect for snorkelers, and great for beginners. Rocks and corral to the north of the entry, and a derelict fishing boat in five feet of water about a half-mile to the south, all attract multitudes of fish. You'll see starfish, puffers and even fire worms. Rent an Aruba timeshare and enjoy Malmok Beach. Your drive on the bumpy and windy road to Dawn Beach will improve now that resort development has begun in this area. The main reef runs parallel to the shore of powdery white sand, and requires some paddling, but once out you'll find one of the most incredible snorkeling spots in the Caribbean. Be wary that a strong cross-current can develop. Rent a St. Maarten/St. Martin timeshare and enjoy Dawn Beach. Just outside the capital city of George Town, Devil's Grotto is the most popular snorkeling site on Grand Cayman Island. Towering coral and limestone create a labyrinth of caves and caverns. You'll encounter large tarpon, which are not aggressive, and fun exotic fish such as damselfish, parrotfish and trumpetfish. Rent a Grand Cayman timeshare and enjoy Devil's Grotto. Renowned for its 650-ft underwater snorkel trail, Trunk Bay is classic snorkeling. A tip from experienced snorkelers to this site is to check out the two rock formations that are about 200 feet off shore - you'll find lobsters and even eels hiding there. The beautiful picturesque beach at Trunk Bay will keep the non-snorkeling members of your family happy and entertained. Rent a St. John timeshare and enjoy Trunk Bay. Stingray City/ Sandbar is the Caribbean's most popular animal encounter and considered by many to be the most exciting snorkeling experience in the world. Snorkel in 12 feet of water at Stingray City, or 5 feet of water at Sandbar. Snorkeling tours take you on a short boat ride out to where you'll encounter large groups of friendly stingrays, many of which will eat right out of your hand. 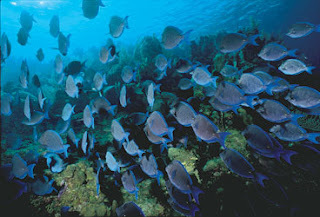 While out there paddle over to the corral reef and snorkel among many more exotic tropical fish. Rent a timeshare on Grand Cayman and enjoy the unique Stingray City/Sandbar experience.